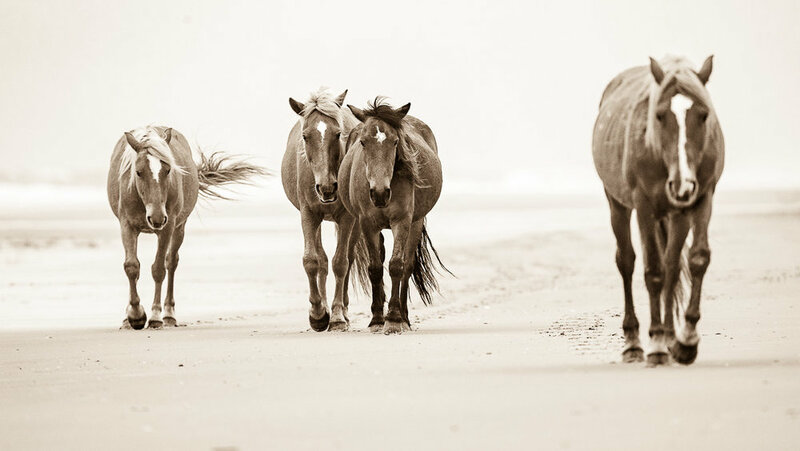 Come photograph the Wild Colonial Spanish Mustangs as they wander through the ever-changing light of the dunes, rich marsh land, and striking beaches of the northern Outer Banks. There are very few places in the world where you can photograph such majestic creatures in their natural environment. My local knowledge and ability to find the horses in this photogenic location (only accessible by 4-wheel drive) will allow you to capture the mystique and independence of these rare beauties. Although photographing the Banker Horses will be emphasized, you will also have the opportunity to capture sunrise, sunset and other subjects in this spectacular coastal environment. We will depart before sunrise and may spend the entire day photographing the wild horses. We will return to the hotel after sunset. We will depart before sunrise and photograph until about 10 am. Lodging - you will need to make your own lodging reservations. I will provide you with lodging recommendations upon registration. This is a great opportunity for you to take pictures of the environment. Most travelling is undertaken on vehicles but some images are best taken away from the vehicle and may involve some very moderate walking. This particular trip involves traveling in a 4x4 vehicle on soft sand. It also involves minimal walking, but that walking will be on soft sand or possibly through wet sand. Guests must complete a standard liability waiver before participating in this tour.